Baron delivers critical weather intelligence to hydro meteorological organizations worldwide. 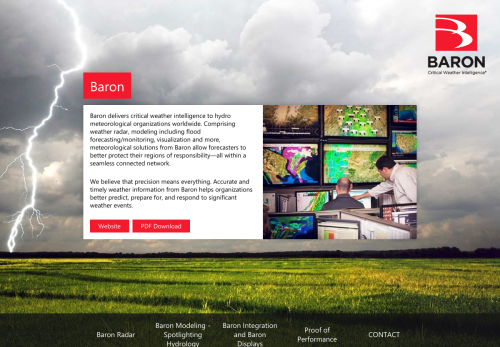 Comprising weather radar, modeling including flood forecasting/monitoring, visualization and more, meteorological solutions from Baron allow forecasters to better protect their regions of responsibility—all within a seamless connected network. We believe that precision means everything. Accurate and timely weather information from Baron helps organizations better predict, prepare for, and respond to significant weather events. Weather radar is the primary data input for any meteorological organization. That’s why we place so much importance on the accuracy and reliability of our radar sensors. Provided in the X, C, High S, and S-Band frequencies with a magnetron or klystron transmitter, Baron Gen3 radar systems feature radial-by-radial calibration, ensuring continuous automated recalibration of the radar system regardless of weather conditions. CLEAN-AP™ clutter suppression, greatly reduces data contamination caused by moisture, terrain, buildings and fauna. The result of these technologies is the most accurate radar data in the industry. Baron Gen3 systems are available in fixed, mobile and transportable configurations. Dual-pol is a standard feature with Baron radar. Baron provides Numerical Weather Prediction, Hydrological, Transportation, Air-Quality, Marine, Agriculture, and other modeling. To spotlight Baron’s Hydrological modeling, whether for flooding, water management or power generation, hydrological applications highlight the benefits of a distributed meteorological network. In addition to enabling more accurate routine monitoring of water and flow levels for rivers, streams and dams, we provide forecasters with vital awareness leading up to significant hydrologic events. Baron-proprietary and most other available models can be integrated. As the event begins, forecasting is supplemented with the detection capabilities of the network. Radar, remote sensors, river gauges and other data inputs can be seamlessly integrated to provide network-wide decision support. Additionally, mobile alerting informs stakeholders, operational personnel and the general public about approaching hydro meteorological dangers that may affect them. Comprehensive systems integration is a core expertise at Baron. We have the unique ability to incorporate a varied area of sensors, models, and other data inputs, bringing them together into a unified and consistent network. This approach allows all personnel access to critical information, ensuring that correct and informed decisions are made. The Baron Lynx display is the visualization hub of the network. All information generated by the network can be displayed within an easy-to-use interface, which can be supplied in the customer’s native language. With Lynx, meteorologists can access information generated by the network across the entire organization if desired. Baron has deployed weather solutions around the world, from Saudi Arabia and Morocco to Indonesia, Taiwan, Bangladesh and more. With L-3 STRATIS, we performed a comprehensive upgrade of the U.S. NEXRAD network to dual-polarization. Together, these solutions have encompassed capabilities as broad as dual-pol weather radar, alerting, flood forecasting and visualization. Baron customers use our systems to accurately predict and track significant weather events, making effective decisions for the protection of life and property. Please fill out the form below and Varysian will enable communication with Baron.